Day of Clean Brightness reminds us of our commonalities—the complexity of our relationships with our parents and children, the deeply felt love and grief after loss, suffering and the unforgiving nature of disease. Life is lived in “the body/with its humors, intimate oils, the skin’s/wavering—bits of inessential/growth in delicate folds.” Neighbors appear with a familiarity, care, and respect as people we know and yet don’t fully know. “Tomorrow the morning sun will cast a maple’s shadow. 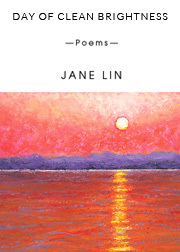 Within it, an inverse silhouette of light.” Jane Lin’s Day of Clean Brightness is a moving, luminous book that singularizes mourning by using close attention, surprising details, and visionary edges. 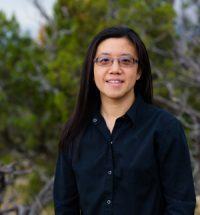 Jane Lin is a poet and a software engineer for an environmental consulting company. She studied under Denise Levertov at Stanford University and received her MFA from New York University’s Creative Writing Program where she was a New York Times Company Foundation Creative Writing Fellow. Her poem “Signs and Portents” was transformed into an art song by Emmy Award-winning composer Glen Roven for his composition “The Santa Fe Songs” for soprano and piano and appears on Talise Trevigne’s album At the Statue of Venus. Her honors include a Kundiman fellowship and scholarships from Bread Loaf Writers’ Conference and Taos Summer Writers’ Conference. For many years she taught creative writing at UNM-Los Alamos and facilitated the Mesa Public Library Poetry Gathering series. Jane lives in Northern New Mexico with her husband, daughter, and three cats. She was born and raised on Long Island, NY.